Posted on 4, April 2016 by EuropaWire PR Editors | This entry was posted in Education, Germany, Healthcare, Science and tagged Immunobiochemistry, inflammation, LMU, Moritz Gaidt, Veit Hornung. Bookmark the permalink. MUNICH, 04-Apr-2016 — /EuropaWire/ — The immune system in vertebrates is capable of distinguishing “self” from “non-self” components, which enables recognition and destruction of invasive pathogens and aberrant cell types such as tumor cells. Adaptive immune reactions, e.g. based on antibodies, are powerful and highly specific, yet require tedious and time-consuming gene rearrangements. For effective immediate defense, intruders must be detected rapidly, and this task is performed by the so-called innate immune system. 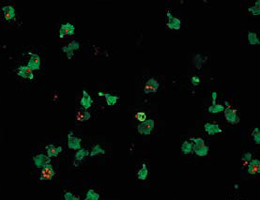 Innate immune cells express a relatively small set of receptors on their surfaces, which recognize molecular structures that are uniquely associated with pathogens. Binding of these structures triggers an inflammatory response that kills the pathogen or the infected cell. In order to analyze the signal pathways that mediate these processes, researchers led by Veit Hornung, who holds the Chair of Immunobiochemistry at LMU’s Gene Center, combined two different methodologies. They first utilized a novel cell culture system that mimics the function of monocytes, a class of immune cells involved in regulating inflammation. Then they systematically deleted single genes to determine their role in initiation of the inflammatory response – and uncovered a previously unknown signaling pathway. The findings appear in the journal “Immunity”. Hornung and his group began their study of a protein complex called the NLRP3 inflammasome at Bonn University Hospital before he moved to the LMU in October 2015. This complex is found in monocytes, and plays a key role in inducing inflammation, as well as being implicated in diseases associated with chronic inflammatory reactions, such as gout, Type 2 diabetes and arteriosclerosis. However, our knowledge of its mode of action is primarily based on studies carried out in mouse cells. In mouse monocytes, two stimuli are required to cause the NLRP3 inflammasome to trigger secretion of the pro-inflammatory signal protein interleukin 1beta (IL-1), while freshly isolated human monocytes were found to produce IL-1 in response to a single signal, which acts via a receptor called TLR4. However, no established human monocyte-like cell lines react to this signal. This is why Hornung and his colleagues had to employ the new human monocyte-like cell line in order to understand the basis for the species difference. “We developed a procedure which allowed us to specifically delete single genes in cultured human immune cells that closely resemble human monocytes. Using this system, we were able to identify, at the genetic level, the components responsible for signal transmission to, and activation of the NLRP3 inflammasome,” explains Moritz Gaidt, a doctoral student in Hornung’s group and first author of the new study. In this way, the team was able to analyze the secretion of IL-1 by human monocytes in unprecedented detail – and to define the mechanism that enables human NLRP3 to be activated in response to a single signal. The new study underlines the fact that results obtained in mice are not always translatable to humans. So far, only human monocytes have been found to react directly to contact with LPS by releasing interleukin 1, without the need for a second signal. The researchers now intend to analyze the in-vivo function of the TLR4 receptor in other model organisms. Using Hornung’s monocyte-like cells, it should be possible to identify further signal pathways in vitro. “Our results refute some of the classical tenets of inflammasome research. We hope that our new method will also enhance our understanding of the cell biological basis of immune disorders,” Hornung concludes.